Olathe North will travel to Blue Valley to take on the Tigers in the Class 6A semifinal on the east side of the bracket. Despite these two programs being rich with tradition, many in the state would consider last week’s wins by the Eagles and Tigers to be upsets in the quarterfinal round. Olathe North is back in the 6A sub-state semifinal for the third consecutive season having lost to Shawnee Mission East the previous two trips. This year, the Eagles reached the final four by knocking out defending champion Lancers 44-30 in a statistically bizarre game. Shawnee Mission East amassed 388 yards of total offense to Olathe North’s 207. The Lancers ran 89 offensive plays to Olathe North’s 25. Incredibly, the Eagles won the game by two touchdowns thanks to big plays and three kickoff returns for touchdowns. Isaiah Simmons returned a kickoff 98 yards for a score in the third quarter after the Lancers had pulled to within 21-17. Olathe North also scored via a short field after recovering a Lancer fumble. Simmons also caught a touchdown pass and rushed for a score. Storey Jackson returned two kickoffs for touchdowns, including a late return of an onside kick. Simmons is one of the state’s best players and has put up exceptional numbers at receiver this fall. The 6-foot-3, 212-pound senior has only 26 receptions but for an incredible 879 yards and 11 touchdowns. Consistent with the Eagles big-play performance in last week’s win, Simmons averages 33.8 yards per catch. Quarterback Matt Wright has delivered on about half of his pass attempts for 1,392 yards and 17 touchdowns. Wright is also a 1,000-yard rusher with 1,027 yards and 12 touchdowns on the season. The Eagles are led by senior Vinnie Shabazz who has rushed for 1,868 yards and 24 touchdowns on 249 carries. Blue Valley advanced to the state semifinals after falling to Olathe North in last year’s quarterfinal round, 27-14. The Tigers won the 5A state championship in 2013. Blue Valley and Olathe North met in the 6A semifinal in 2009 with North kicking a late field goal to beat the Tigers, 16-14. Olathe North went on to complete a 13-0 season by drilling Wichita Heights 37-3 in the state title game a week later, while Blue Valley finished the season at 5-7. Last week, Blue Valley scored 28 points in the second quarter to knock out top-ranked Lawrence in a 42-17 win. The momentum of the game changed with the Tigers leading 14-7, defensive end Jeff Gurley returned an interception 27 yards for a touchdown and a 21-7 lead. William Evans scored with under a minute to go in the half for a 28-7 lead. Evans carried the load for the injured A.J. Totta by rushing for 230 yards and two touchdowns on 32 carries. Colton McCumber passed for 166 yards and three scores for the Tigers. After giving up more than 27 points per game in the first six weeks of the season, the Tigers are surrendering only 12 per contest since. Blue Valley held Lawrence back J.D. Woods to 53 rushing yards last week. If they can limit Shabazz in a similar fashion, Blue Valley may be playing for another title. Both Lawrence Free State and Derby enter this contest having won eight games in a row. Free State has an average scoring margin of 40-11, while Derby has an average margin of 54-18. The Firebirds reached sub-state last season and fell at home to Hutchinson. Derby won state in 2013. Free State opened the season 0-3 but outgained each opponent. After a Week 4 victory versus struggling Leavenworth, the Firebirds climbed back into contention with a win versus Shawnee Mission East that ended the Lancers’ 17-game winning streak. Free State has a ground-heavy attack led by senior dual-threat quarterback Bryce Torneden and running back Sam Skwarlo. The Firebirds have been remarkable consistent on the ground with 276 rushing yards and 6.1 yards per carry. In the eight-game run, the numbers stand at 303 a game and 6.5 a carry. 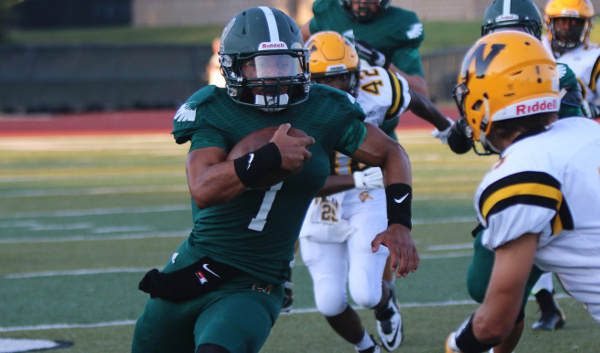 No team has held Free State under 190 yards, but its season high is 377. Skwarlo has scored in every game and has 1,484 yards and 21 touchdowns. However, in the 8-0 run, he has 1,190 yards and 18 scores. The Firebird rush defense permitted 246 a game in the 0-3 start and allowed 145 and 3.6 yards per carry since. Torneden has thrown for 1,242 yards and rushed for 1,035. The pass defense has been exceptional all season. Free State has allowed 56 of 144 passing for 749 yards. In the last three games – versus Topeka High, Wichita West and Wichita Northwest – the pass defense has permitted 15 of 52 passing for 257 yards and four interceptions. Free State picked off Northwest quarterback Kevin Folsom three times in last week’s 52-34 victory. Folsom had a 25/0 TD/INT ratio entering the contest. The Firebirds switched to a 50 defense from its normal 3-5-3 and has allowed just 14.5 points per contest. In 2014, it allowed 21.9. Jay Dineen is the defense’s heart at linebacker. In games against Topeka and Wichita West – common opponents with Derby – Free State won 21-0 and 49-0. Derby defeated Topeka in Week 9, West in the first round. It held the two opponents to a combined 35 passing yards and 91 carries for 282 yards, or 3.1 yards per carry. Derby defeated West, 56-28, and Topeka High, 52-21 in Week 9 and first round of playoffs, respectively. West had 281 offensive yards, including 260 on the ground. Topeka finished with 276, including 176 rushing. Derby is a two-point favorite over Free State, although the Panthers are down to their fourth-string running back and have used standout quarterback Brady Rust often. In the last four weeks, Rust is 22 of 42 passing for 441 yards with four scores versus two interceptions. He has rushed 81 times – 35 last week – for 760 yards and 14 scores. Derby is the No. 1 offense in the classification at 543 points and has allowed 214. Free State has a total margin of 377-160. Kai Lemons, with two catches for 110 yards in the first-round playoff victory, presents a big play threat. Sophomore Brody Kooser, the fourth-stringer at the start of the season, had 102 rushing yards last week. Free State’s run offense and pass defense have been quality against every opponent. The Firebirds wear down Derby and collect the win.